I know many of you have been waiting for a new post from me. After a lot of restructuring, I’m happy to be making this post in the newly revamped Divine Taste home. All the old features loved by you are intact. At the same time, in the new site the sections for Sattvic Food, Ayurvedic cooking, Temple Food and Eggless baking- the prime highlights of this site, have been made more accessible. And there are a ton of other features for you to explore, with more exciting stuff (Anushruti’s World) on the way! 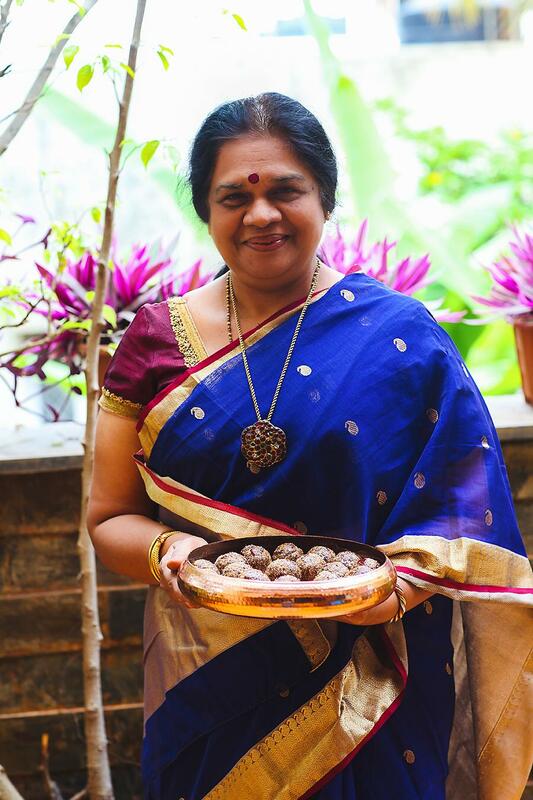 For this new beginning, I thought the best recipe to share would be my mother’s date and poppyseed laddu recipe. She loves to make them and feed everyone around her and everybody loves them too. 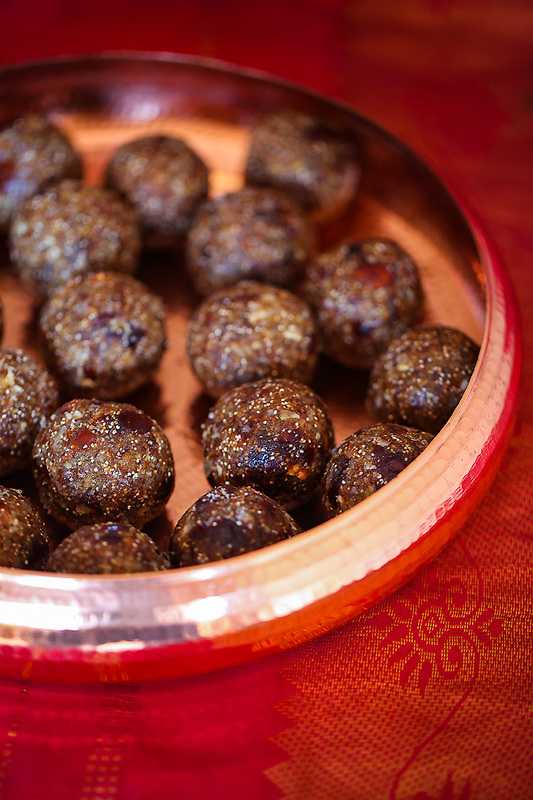 What I love about these laddus are that they are wholesome and nutritious, loaded with the goodness of dry fruits. You can make them for a festive occasion or just to keep as a power snack when you need to get your energy levels up! They can give any energy bars in the market, a run for their money! 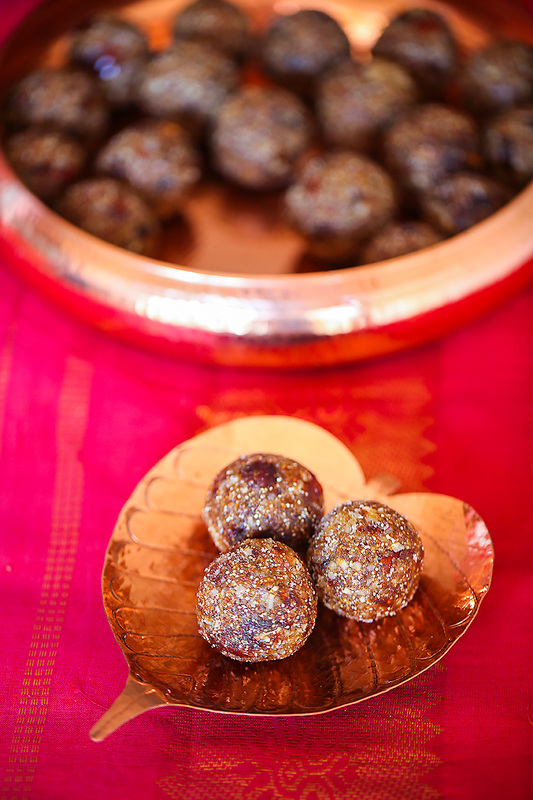 I often get parcels of this laddu delivered and I love to snack on them to get my energy levels going. They are delicious and satisfying. 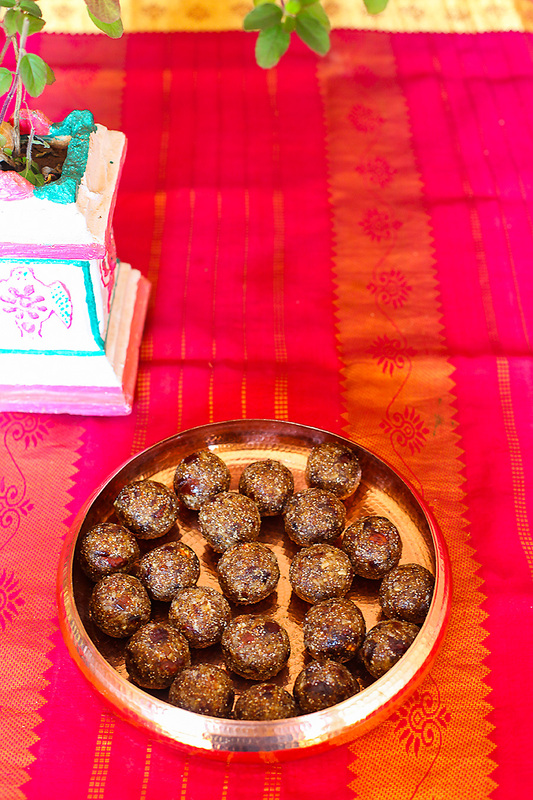 I shot these laddus once when I was visiting my parents. 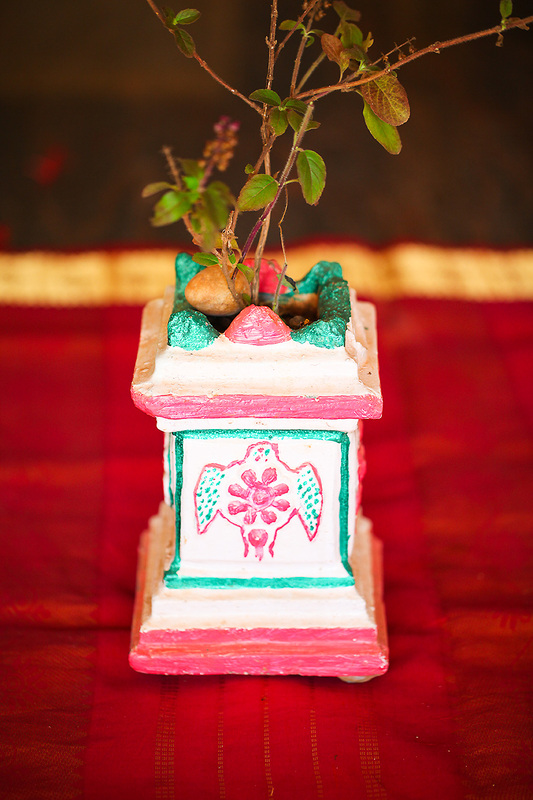 Many pictures on this site have been shot in the dining area of my parents home which opens up to a nice open sit out with a number of plants, the Tulasi or holy basil plant being one of them. 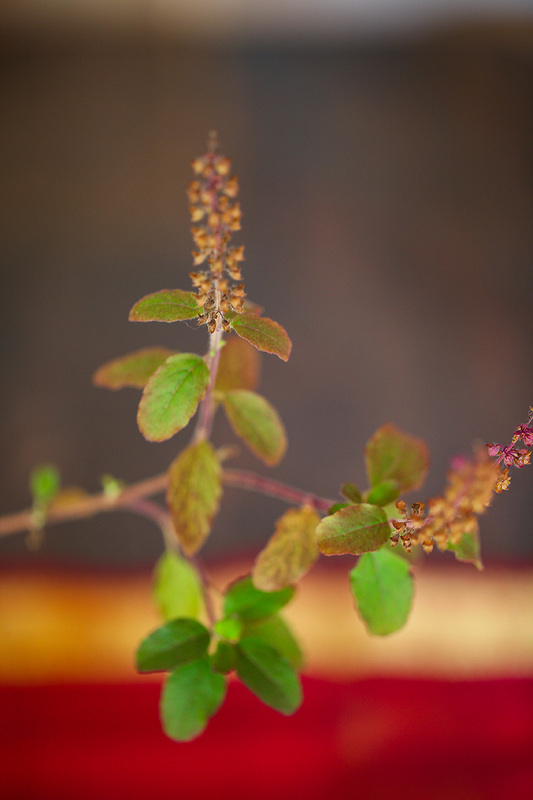 Since the holy basil is considered auspicious, I only thought it would be apt to include it here in today’s post. My mother has green fingers and has always been interested in gardening and I have nice memories of her tending to the garden and planting different varieties of flowering plants during my childhood. But the highlight of my childhood was the food she cooked for us. I can never tire of talking about the curries, cakes, halvas, sambar and other tasty snacks and breakfast items she made for us. 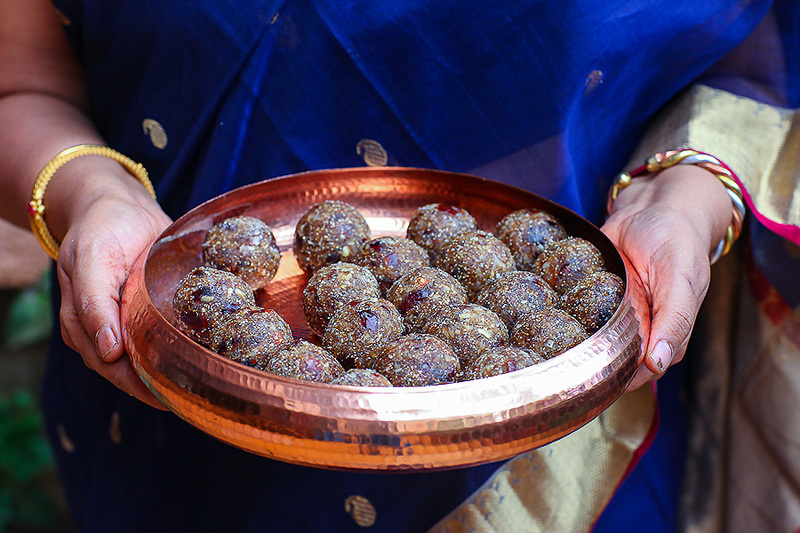 These laddus are a special treat from her kitchen and I hope you enjoy them as much as I do. To celebrate the launch of the newly revamped divinetaste.com, I have 2 exciting giveaways happening where you could have a chance to win a Kitchenif Icecream Maker. For more details visit my instagram profile or my facebook page. If the dates are not deseeded, deseed the dates and chop them fine. In a heavy bottomed wok or kadhai, put in the poppy seeds and roast for a few seconds or until they are aromatic and change their colour a little. Be careful not to blacken them. In the wok or kadhai, dry roast the coconut for a few minutes on low heat until the coconut changes to a golden brown shade. Take the coconut out of the wok and add the chopped almonds and roast until the almonds change colour, about 3 to 4 minutes. Keep aside. Grate the nutmeg and powder the cardamom seeds and keep aside. 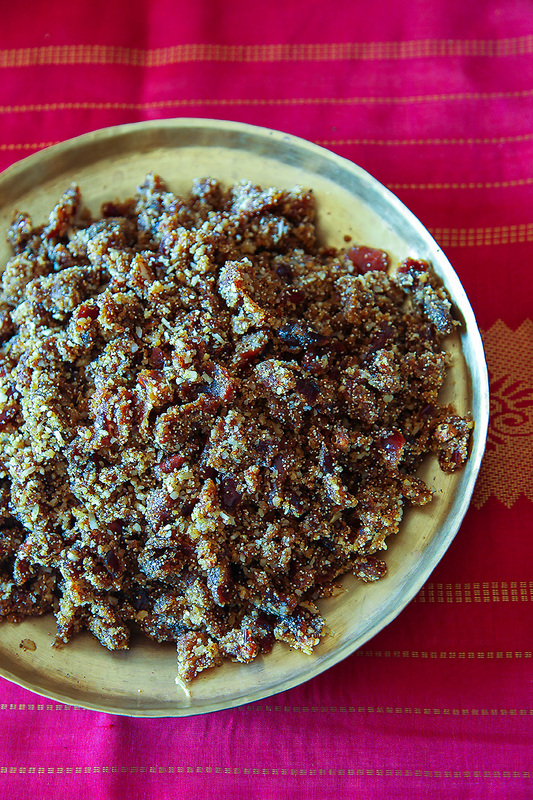 In the same wok or kadhai add the ghee and after it melts put in the jaggery. On low heat, stir until the jaggery melts. Do not allow the jaggery to boil. Turn off the heat. 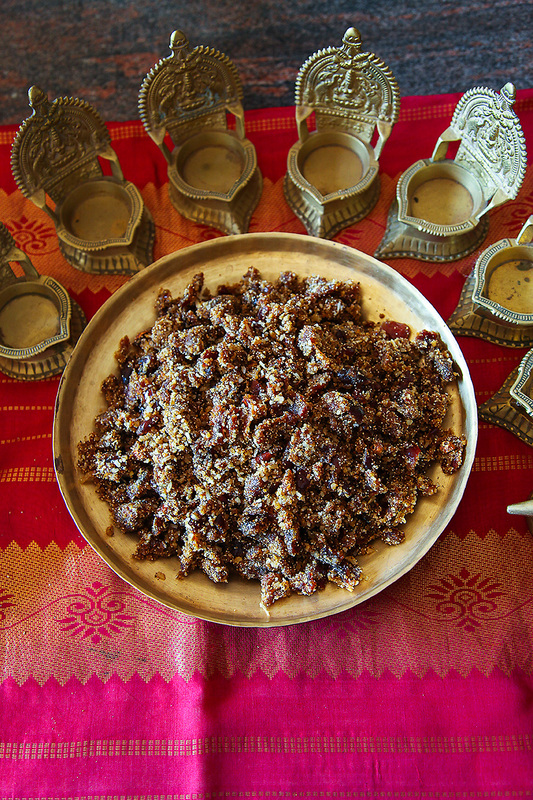 After the jaggery cools down a bit add all the ingredients to it- the dates, poppy seeds, dry or dessicated coconut, almonds, nutmeg and cardamom. Form into round balls by taking a little mixture and pressing it inside your palm. Makes 35 to 40 laddus depending on the size. I love this combination, couldn't have come up with it myself. Thank you. Your blog looks amazing! Thank you! I'm glad you love this new space! The recipe is fantastic, like the idea of adding white poppy seeds and nutmeg. Glad you provided the vegan option as well for me. The dates are sweet already (good, natural sugar). What is the reason for adding additional jaggery (gud)? This is a traditional recipe. 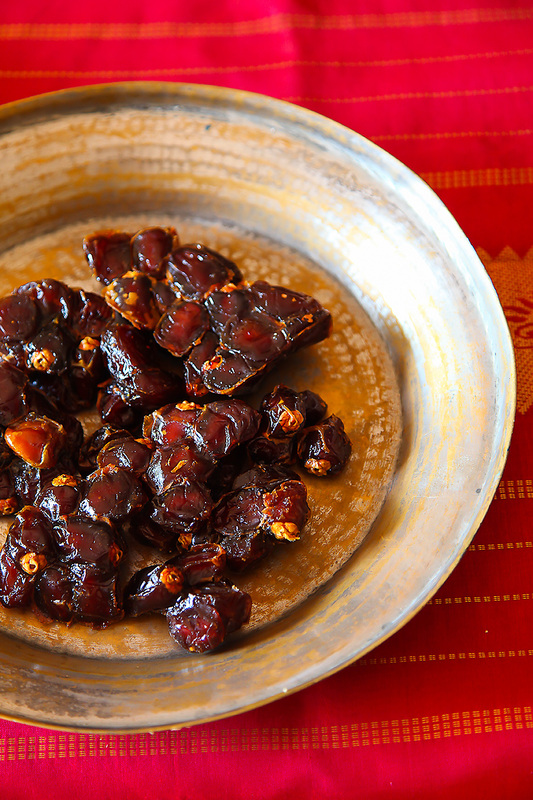 You can skip the jaggery and put in more dates if you prefer. Traditional recipe but i like the way you have presented this here but i want to thank you for providing vegan option also. Glad you liked it Anupama!